With two weeks left in the season, it's time to consider the candidates for each of the league's regular season awards. We continue with the Kia Defensive Player of the Year Award. Steals and blocks certainly aren't the best measure of defense, but the former is an indication a player's activity on the perimeter and the latter is an indication of a player's ability to protect the rim. 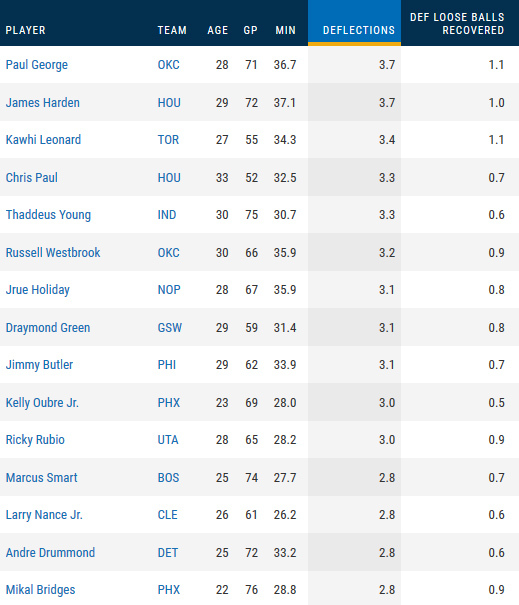 - The league leaders in steals per game are Paul George (2.2), James Harden (2.1) and Russell Westbrook (2.0). - The league leaders in blocks per game are Myles Turner (2.8), Mitchell Robinson (2.4) and Anthony Davis (2.4). - There are eight players who have averaged at least one steal and one block in 50 games or more. 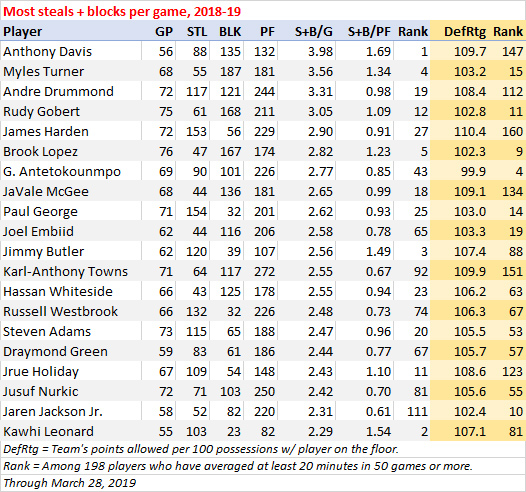 The top 20 players in steals + blocks per game includes the five guys - Giannis Antetokounmpo, Joel Embiid, Paul George, Rudy Gobert and Myles Turner - that will probably get most of the Defensive Player of the Year votes, as well as former winners Draymond Green and Kawhi Leonard. It also includes four guys - Anthony Davis, James Harden, Jrue Holiday and Karl-Anthony Towns - that play for worse-than-average defensive teams. Here are the top 20, with how many points per 100 possessions their teams have allowed with them on the floor and where that ranks among the 198 players who have averaged at least 20 minutes in 50 games or more. 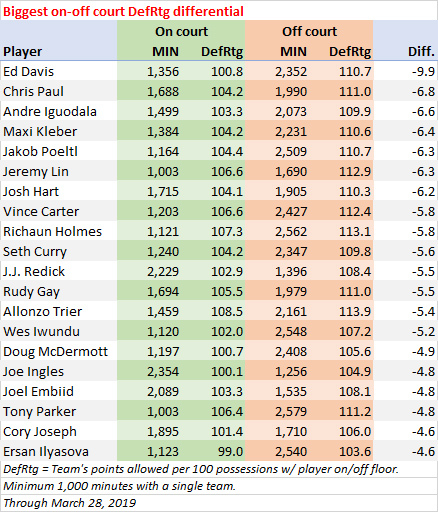 A look at the leaders in on-off DefRtg differential (how a team has performed defensively with a player on the floor vs. off the floor) makes you realize that reserves get to defend other reserves. The only full-time starters in the top 20 are Chris Paul, J.J. Redick (who plays most of his minutes with Embiid), Rudy Gay, Joe Ingles (who plays most of his minutes with Gobert) and Embiid himself. But George ranks 27th, highest among all Thunder players that have played at least 1,000 minutes, with OKC having been 4.0 points per 100 possessions better defensively with him on the floor than they've been with him off the floor. Antetokounmpo ranks 70th (-1.8), Turner ranks 95th (-0.6), and Gobert ranks 108th (the Jazz have allowed 102.8 points per 100 possessions with him both on and off the floor). The leaders in deflections per game are mostly the same guys atop the steals leaderboard. Leonard is a couple of spots higher, though. None of the five DPOY candidates named above rank in the top 50 in charges drawn per game. In fact the five - Antetokounmpo (1), Embiid (1), George (5), Gobert (4) and Turner (1) - have combined to draw just 12 charges all season. Gobert doesn't rank as the best rim protector on his own team, but opponents have still shot just 53.1 percent at the rim when he's been there, according to Second Spectrum tracking. 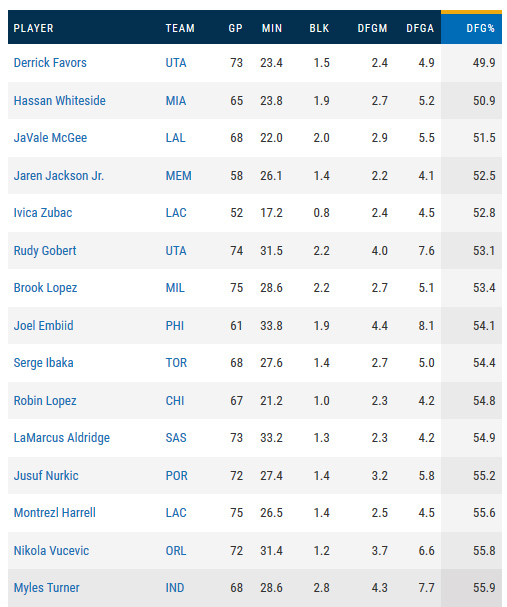 Embiid (54.1 percent) and Turner (55.9 percent) also rank among the top 15 rim protectors. There's more to rim protection than just defending the shots that are taken near the rim. There's also preventing those shots from being attempted in the first place. Shots in the restricted area are the most valuable shots on the floor. As a whole, the league shoots 63 percent in the restricted area, a value of 1.26 points per shot. And as a whole, the league takes 33 percent of its shots in the restricted area. Preventing those shots is partly about a team's defensive scheme. Only 26 percent of Milwaukee's opponents' shots have come from the restricted area when Brook Lopez has been on the floor. That's the lowest rate among the 340 players who have been on the floor for at least 1,000 opponent field goal attempts. And it's lower than the Bucks' opponent rate when Lopez has been off the floor (30 percent). The Bucks' rim protection (and, in turn, it's top-ranked defense) is about both scheme and personnel. Embiid, Gobert and Green have similar on-off differentials in regard to preventing shots in the restricted area. Turner, however, does not. Indiana opponents have taken a greater percentage of their shots in the restricted area while he's been on the floor than they have while he's been off the floor. Antetokounmpo doesn't protect the rim as often as Lopez, but he affects shots all over the floor. According to Second Spectrum tracking, opponents have shot just 40.6 percent when Antetokounmpo has been the closest defender, 6.2 percentage points lower than their average on those shots. ... doesn't produce any differential close to that of Antetokounmpo.